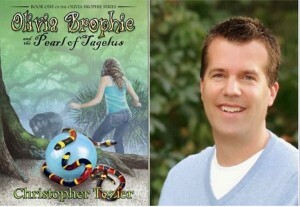 On Tuesday this week, we were fortunate enough to skype with children’s author Chris Tozier, who wrote the Olivia Brophie fantasy series. Although our class hadn’t yet read Chris’s books, the students were very much engaged throughout the skype call and asked excellent questions of Chris. Chris’s Skype session was both informative and entertaining. His insights into an author’s life were captivating to the children. We learnt that authors spend most of their time editing their writing. Chris spent two years working on the 260-page ‘Olivia Brophie And The Pearl Of Tagelus’ before it was good enough to be published! After telling us about an author’s life, Chris played his ‘sentence game’ with the children. The students were presented with a simple sentence, which they had to edit to transform into an exciting sentence, using advanced vocabulary. As Chris stated during the game, ‘words to the writer are like colours to the painter’. We loved this image! Another game we played involved using the technique ‘Show, Don’t Tell’, in order to convey a character’s feelings without stating them. An example of this would be to write ‘Owen’s palms felt sweaty. His breathing was rapidly becoming ragged as his pulse quickened more and more…’ instead of writing ‘Owen was scared’. Overall, this Skype experience was rated as an ‘awesome’ one by the students. We are so lucky to be given the chance to interact with such experts as Chris, who showed us how important it is to be able to use our literacy skills to a high level – in the context of real life. I think you did a good job in telling the story. It is simple and entertaining!